In today’s composite business environment, where organizations look to their financial department to control expenses, cost and manage external resources, you need accounting management software that puts you in control. To control company expenses and cost, Data Doctor offers Business Financial Management software that easily manage overall financial information of an organization. Professional Financial Accounting program manages total business transaction information including sales/purchase order, sales/purchase register, sales/purchase return and provides the information about various voucher entries like journal voucher, payment voucher, receipt voucher etc. Integrated Business Management system generates various accounting reports to view business transactions including balance sheet report, profit and loss report, trial balance, stock report, sale and purchase report etc. Business Financial Accounting software (Standard Edition) provides the financial management solution to manage bookkeeping records and other aspects of your business including Account management, Customer management, Vendor management, Item management and Tax information management at one place. Business Accounting software allows you to create and maintain new financial records, and facilitates with user authentication feature to modify the existing records for higher level of security. Business Bookkeeping software is useful for small to large business organization to manage total expenses and income of the company, and manage your entire business with one complete solution. Manage overall business financial records in proper manner. Facilitate to manage account information, customer and vendor information, item information and tax related information. Create new company records and provide user authentication facility to open or delete any existing records. Software manages all business transactions voucher entries including sales/purchase order, journal voucher entry, debit note, credit note, production etc. 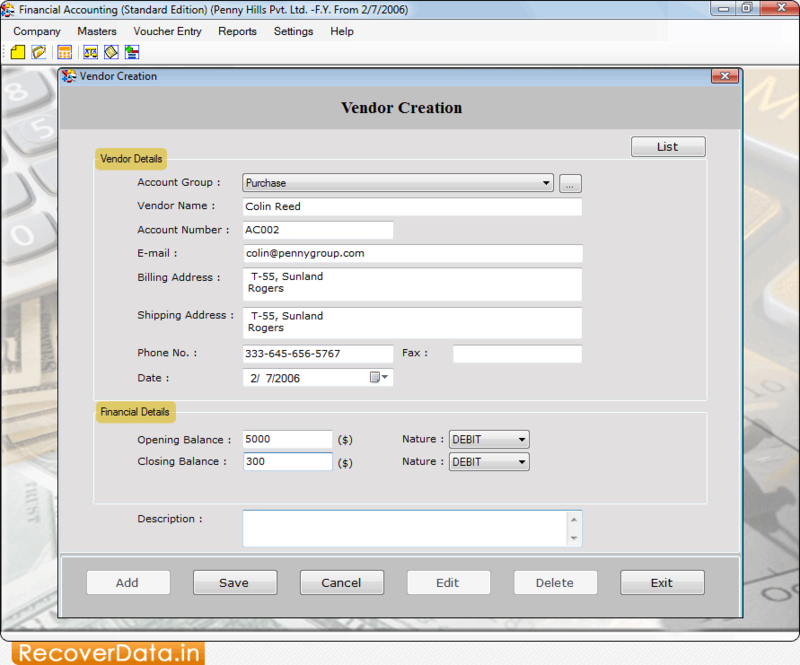 Facilitate with multiple unit creation, currency creation and currency converter feature. Generate various accounting reports to view total business transaction. Facilitate to export the data of accounting reports in PDF or Excel file format.